You might think a battery is a battery is a battery, but the truth is they come in an array of types and styles. 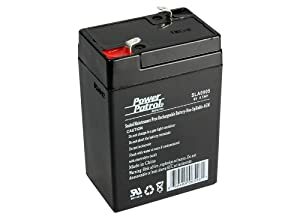 While 12v batteries are used to run cars, boats, and RVs, smaller vehicles like golf carts and motorcycles often use 6v batteries. They can also be useful in background systems, like alarms and emergency lighting. Looking for the best 6v battery? The right one will depend on exactly what you plan to do with it, but the list below will help you narrow down your search. Check out the full product reviews to learn just what we like about each of our top 10. We’ve done some of the legwork for you here and picked out our 10 favorite 6V batteries. Check out the full reviews to help you find the right one below. The Wildgame 6V battery has a solid capacity and works well in cold weather, making it a great choice for year-round outdoor use. Finding the right battery to fit your needs can sometimes be a tricky proposition. A smaller battery like this Wildgame 6v rechargeable battery can be a great solution. It fits into whatever devices need a new power source. Even though this battery is small, it still gives you the same power as comparable brands. In a trickle charge or float use, it works beautifully. If you’re using it in something like a camera, you will need to watch the level and charge it often. Deep discharges can drastically shorten its lifespan. 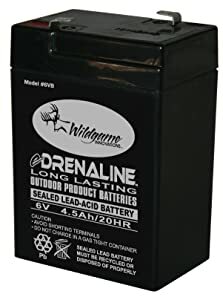 Convenience is definitely the main advantage of this Wildgame battery. It’s easy to install, absolutely maintenance free, and will last a while once you install it. It’s the best 6v battery if versatility and usability are your main concerns. Priced to fit any budget, the Universal Battery 613K is certainly not cheap when it comes to building and power. For the super budget-conscious buyer looking for the most affordable option, Universal Power Group is a great place to go. Their batteries use a no-frills design that keeps the price low without sacrificing quality. 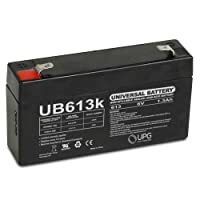 The capacity of the UB613k is on the low side at 1.3Ah. This is plenty if you need the battery for something like an emergency lighting system. It might not be sufficient for things that need more power, though. Aside from that, we have no complaints against this battery. It’s a solid lead acid battery that’s lightweight, compact, and easy to install. And you definitely can’t argue with the price. The EXP645 is the perfect choice for alarm systems or emergency lights because it’s reliable even with non-daily use . This is a great choice if you’re buying a battery for an alarm or lighting system. It can put out a lot of power when you need it but also holds its charge well. The reliability of the EXP645 is the main reason it caught our attention. Not only is this battery reliable, but it’s also durable. The casing is designed to resist impacts and vibration. It also won’t take damage from external shocks or high temperatures. The only things that can seriously damage it are deep discharges and overcharges. You’ll get the most out of it using a trickle charge or float charge. If you’re kind to this battery, you can get up to two years of use out of it. Realistically, you’ll probably have to replace it closer to the 18-month mark—about average for this type of battery. At the price, though, it’s a great value. 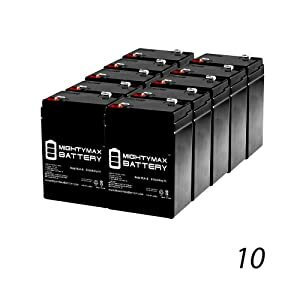 If you need a lot of batteries, this 10-pack from Mighty Max is an exceptional value. You might think this one is a bit out of your price range until you look a little closer. This isn’t a single battery—it’s a pack of 10 batteries. Turns out, this makes it a great value at the per-battery level. 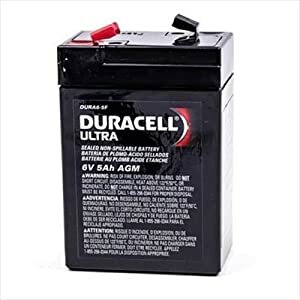 In fact, it might be the best value for a 6v golf cart battery out there. These Mighty Max batteries are sized to be versatile. They’re designed with UPS applications in mind and work best when used in a float capacity. The capacity is around average for a 6v battery. Where they excel is in giving that same charge every time, even after many recharges. It’s best if you use these batteries right away. They’ll last a little while in storage but not more than a couple years. If you need a lot of batteries, though, this is the best way to get them without spending a ton of money. The AJC JM-6M4 is a worry-free replacement battery for everything from spotlights to pumps. 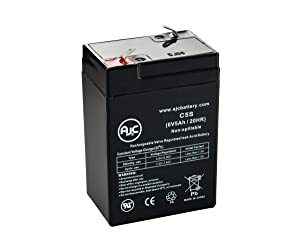 AJC Battery has made their name with replacement batteries sized to OEM standards. This replacement for a Jiming JM-6M4 is the high-quality sealed lead acid battery for pumps, lights, and more. At just over ten bucks, you’ll get a lot of power for your money. The main thing you want in a battery is consistency. You don’t want to have to think about it once it’s installed. That’s what you get with AJC 6v batteries. It puts out a consistent charge and will do so for years. This makes it a great choice for back-up systems, too. Sizing on replacement batteries can always be tricky. The battery itself fits perfectly, but the terminals won’t fit all connectors. That can be a bit of a hassle since it doesn’t come with its own cables. Even with this added expense, it’s a much better value than the battery it’s built to replace. 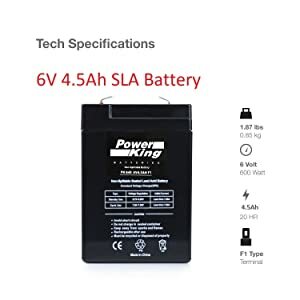 The Interstate 6v SLA battery has a great balance of weight, price, and capacity, though the durability of the casing does leave something to be desired. You don’t have to sacrifice capacity to get an affordable replacement battery. This option from Interstate has a 4.5Ah rating and costs just over ten bucks. It’s sized perfectly to fit Coleman lanterns and similar products. Now, this is a spillproof battery. As long as you don’t damage it, it’s completely safe and won’t leak any battery acid. The case isn’t as resistant to drops as more expensive batteries and can split if you’re rough with it. Keep this in mind if you’ll be using it in any equipment that takes abuse. This battery probably won’t last as long as most of the others on the list. Recharges wear it out fairly quickly, along with the susceptibility to damage mentioned above. For the right application, though, it’s a strong battery at the right price. This 4-pack of batteries from Beiter is the best solution for affordable replacement of multi-battery lighting systems. The obvious advantage of a multipack is convenience. You’ll also tend to save a bit of money in the long run if you know you need a lot of batteries. These Beiter batteries are a perfect example, letting you power a whole system with one purchase. 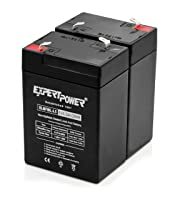 This is a great battery for UPS applications. They have a fairly standard capacity of 4-5Ah and a nice compact design, weighing just a couple of pounds. The terminal style makes it easy to connect either singly or in parallel. These aren’t the best batteries to store. They won’t hold their charge well long-term if they’re not used regularly. For immediate installation, though, they’re a good option. With a high capacity, this is the best 6v battery for UPS applications. For the most power and longest life between charges, AJC has you covered. With 16 amp hours, it gives you a high capacity for a 6v battery. This also gives it a longer overall lifespan—up to 5 years, if you use it right. 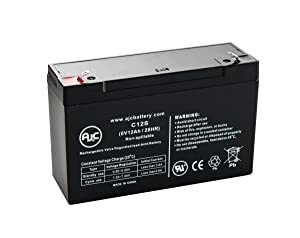 The AJC BP12-6 is a replacement battery for products that use B&B batteries. The only issue in terms of sizing has to do with the terminals, which are narrower than the standard size. This may require you to buy new connectors before it’ll work in many vehicles and devices. Even though this is an “off-brand,” so to speak, the construction quality is high. It stands up to just as many charges as name-brand batteries of the same type. This makes it a great replacement for B&B 6-volt batteries in all applications. The Duracell 6-5F costs more than most 6v batteries you’ll find, but this extra expense will bring you a longer-lasting, more reliable power source. Duracell is a name that people know and trust. This battery lives up to that solid reputation. You’ll get more out of each charge and get more total recharges than with other similar batteries. In fact, in terms of performance, this is one of the best 6v batteries on the market. This is a good battery if you need to lose it a lot. It does lose its charge fairly quickly in storage and will need occasional top-offs. The good news is that if you forget you won’t damage the battery. It’s better at dealing with deep discharges, and even complete discharges, without losing capacity. As you might expect, this Duracell comes in at a higher price point than many of the other options. You’ll be paying both for the name and the quality. Aside from the price, though, we highly recommend this battery.